From Inverness follow the A9 North to the Tore roundabout (approx. 6 miles). Take the second exit A835 signposted Dingwall and continue to next roundabout (approx. 5 miles). Take the third exit A862 and enter Dingwall. 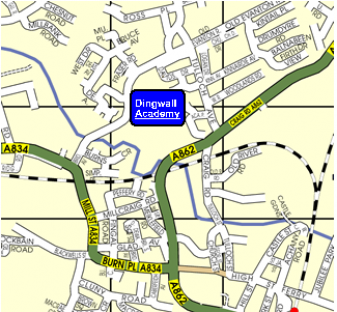 Continue on the A862 through Dingwall, you will see the Academy on the left after you cross the railway line. Turn left into Tulloch Avenue at the traffic lights and then next left into Academy Park at the Leisure Centre and then continue round to the right into the Academy car Park. See map below.